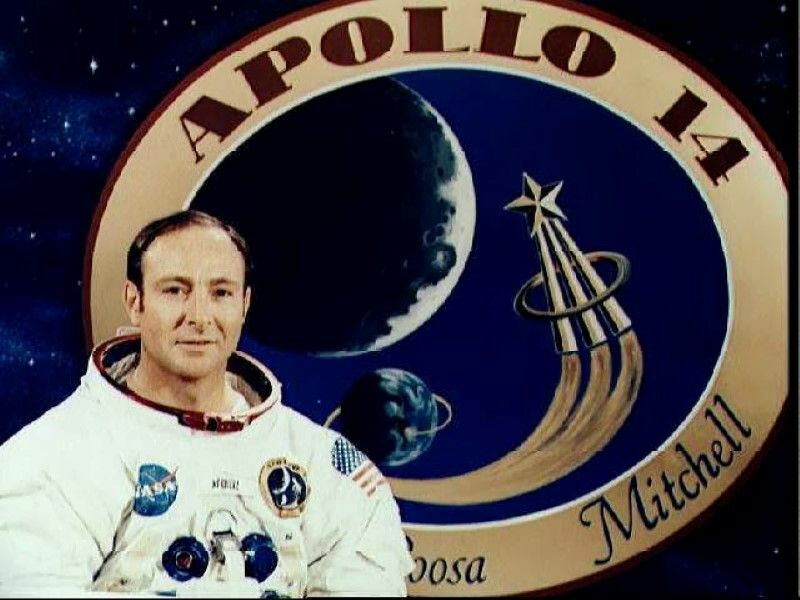 Apollo astronaut Edgar Mitchell returned from his mission to the moon a changed man. He has spent the last 35 years trying to use the tools of science to figure out what happened. Along the way, he says that people knowledgeable about an alleged crash of an alien spaceship in Roswell, N.M., shared the information with him. He’s been speaking out ever since, most recently on a radio talk show that tripped off an unexpected wave of media attention. In a telephone interview with Irene Klotz, Mitchell sets the record straight — as he sees it. Edgar Mitchell: Just a minute … I’m sorry. My dog jumped in my lap and knocked over my coffee cup. It’s OK. Go ahead. IK: What’s your dog’s name? EM: Yup, I’ve got two of them and right now they’re telling me that it’s their suppertime and I must come in and fix their supper … at least that’s what they want. IK: Well first of all thanks very much for making a little time. I wanted to ask you if there was anything about the radio interview you did that was different from what you’ve said in the past. EM: No, there’s nothing different. Several of (the reports of the interview) that I’ve seen come around have some flaws in them. Some of the reports pushed it or spun it incorrectly. NASA had nothing to do with anything I’ve done. I wasn’t briefed by NASA. There haven’t been any sightings as a result of my flight service there, so if that part of it comes out on anything you’ve seen it is just totally wrong. IK: Yes, I did want to clarify that. EM: My major knowledge comes from what I call the old-timers, people who were at Roswell and subsequent who wanted to clear the things up and tell somebody credible even though they were under severe threats and things — this was back in the Roswell days. Having gone to the moon and being a local citizen out in the Roswell area some of them thought I would be a safe choice to tell their story to, which they did. Even though the government put real clamps on everybody, it got out anyhow. Subsequent to that, I did take my story to the Pentagon — not NASA, but the Pentagon — and asked for a meeting with the Intelligence Committee of the Joint Chiefs of Staff and got it. And told them my story and what I know and eventually had that confirmed by the admiral that I spoke with, that indeed what I was saying was true. IK: You mean what had been told to you was true? EM: Yup, in other words. There was a UFO crash. There was an alien spacecraft. This gentleman tried his damndest to get me in and like so many others in the administration over the last 60 years, since JFK’s time, was unable to. He was told ‘Admiral, you don’t have a need to know, and therefore go get lost,’ essentially. IK: Have you ever come out and said who this person was who briefed you? EM: No, I have not. IK: Would you at some point? EM: No, it is out and around but I don’t feel like I have the liberty to do that. IK: When did you have your meeting at the Pentagon? EM: It was in the late ’90s in Washington when I was there working with The Disclosure Project, trying to get all those opened up with another Naval officer by the name of Will Miller and Steven Greer, who you probably heard of. Steven and I don’t really work on this anymore together, but we did at that point and getting to the Pentagon and seeing what we could do there to try to get this opened up. IK: Why do you think the government hasn’t acknowledged that there is life outside of Earth? I thought that was sort of the point of NASA. EM: Well most people in government don’t know. The government is highly compartmentalized. You could work next door to somebody for 30 years not knowing what they’re doing in certain areas. The whole point of all of this … goes back to World War II. This Roswell incident took place right at the aftermath of World War II when the U.S. Army Air Corps was split off and became the Air Force and the OSS (Office of Strategic Services), which was the intelligence service of World War II, was disbanded and eventually became the CIA. At that point the Cold War was just starting to move under way and we were at odds with the Soviets. The Air Force was brand new and supposedly in control of the skies and didn’t know what they were doing, and the CIA didn’t know what they were doing, so Pres. Truman was in a big problem here: Here people were telling him there were aliens around and nobody knew if they were hostile or what they were and what was he going to do about it? So he formed a committee, a very high-level military and academic and intelligent people — politically powerful people — and said ‘You guys work on this.’ And that was called … the MAJIC 12. And they did pass a National Security Act, or so I’m told, under highly classified auspices, that gave this committee virtually unlimited power to deal with this issue, which they have done for the last 60 years, slowly excluding everybody — including presidents. You may remember that Pres. Clinton tried to send (Webster) Hubbell to find out about this at Wright Patterson. He got rejected. And Barry Goldwater, back in the ’60s when he was getting ready to run for the presidency and who was a brigadier general in the Air Force Reserve tried to get information about it. He got rejected. And I’m told that Jerry Ford tried to do some finding out and he got rejected. Jimmy Carter announced his observation of UFOs, but that never went anywhere so obviously he made no progress. Only in recent years has the public interest become acute enough and enough stories leaked out so that people are starting to believe that it’s all real. And the fact of the matter is, it is. They’re still around and there’s a lot of stuff going on. Are you aware of the so-called Phoenix Lights Incident? That wasn’t our stuff. IK: I’m sorry. Can you say that again? EM: Lights. Just a few years ago. Three humongous craft flew over Phoenix, very slowly in the middle of the night that clearly were not — I happened to be on the phone with people out there when that happened and have had pictures of it — clearly those were not, to those of us who know aviation and spacecraft, clearly those were not local stuff, home-grown stuff. IK: So you’re saying the incidences are becoming more prevalent among the general public? People are having their own sightings? EM: Just several weeks ago, this so-called incident at Stephenville, in Stephenville, Texas. Another one. And naturally a lot of discounting and unfortunately the press, the giggle factor got up and the press tended to ignore it, but the fact of the matter is this is the real stuff we’re dealing with. We’re not alone in the universe. And it has nothing to do with NASA. As far as I know it has to do with what’s going on and has been going on for a long time. IK: As a man of science and engineering, how did you make this leap from doing what you needed to do to be an astronaut to what you’re doing today? EM: Because I was told by people who were utterly sworn to secrecy under severe penalty if they talked and because I’d been to the moon, because I was a local resident of Roswell when the so-called Roswell incidenttook place, some of them thought I was a safe person to tell before they passed on so that the knowledge didn’t die. There are others like me, people out here who have done an enormous amount of investigation who have seen through the facade and seen through the cover-up and can talk chapter and verse, better than I can. We know it’s real. IK: Can you describe what changed you after you were in space? How did that happen? EM: Well I’ve got a research foundation that has been working on that problem for 37 years. I was coming back from the moon after completing a successful mission on the moon. My job was being responsible for the lunar spacecraft for the lunar surface activities. So on the way home, my successful job had been mostly completed and we were just coming home. We still had experiments and work to do, but the big stuff was done. We were orientated such and rotating in order to keep the thermal balance of the spacecraft so that every two minutes you could see the Earth, the moon, the sun and a 360-degree panorama of the heavens came through the window every two minutes. That’s powerful stuff, particularly since it’s space. Without the atmosphere to block, the stars don’t twinkle, and there’s 10 times as many as you could possibly see on Earth because of the lack of interference and it’s much closer to what you could see through the Hubble Telescope these days, with those pictures and I hope you’ve looked at some of those: it’s overwhelming — and I realized as that happened, because I do have a PhD from MIT and I studied astronomy at Harvard and MIT and knew that molecules of matter in my body and in the spacecraft and in my partners’ bodies were made in some ancient generation of stars. That’s where matter is created. Suddenly I realized that the molecules in my body were created in an ancient generation of stars and suddenly that became personal and visceral, not intellectual and I had never had this experience. It was accompanied by bliss, an ecstasy I had never experienced. Later — and I’m making this long story short — with some discovery and some help from scientists at Rice University in Houston, I discovered in ancient transcripts that this type of experience — a transformational, transcendental experience where you see things as you perceive them but experience them viscerally and emotionally as one, as a part of it — is called samadhi. In doing more research, I found that it has taken place in every culture on Earth. The political and cultural expression of that turns out to be religion. The experience is the same — a heady, overwhelming experience. But when it gets politicized, put into the culture, those things get lost on the people who had the experience and it becomes something else. So that’s what it was: a deep, deep cultural experience that is in the culture of our civilization in hundreds of places. EM: I’m trying to use the tools of science to understand precisely these types of knowledge. IK: Wow, that’s quite a calling. EM: That’s exactly what I’ve spent the last 35 years doing. IK: What’s the tie-in between this pursuit and your experiences with understanding that there are other life forms that have come to Earth? EM: Well it’s just an extension of the cosmology of what’s this whole universe about and what are we about and coming to the conclusion that we are not alone. That’s some of the most important knowledge that we could discover.